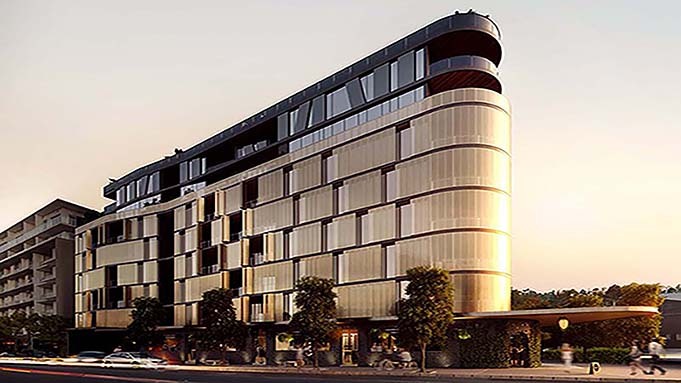 Fabric apartments are located in the inner city Brisbane suburb of Teneriffe. Teneriffe is located 2.5km to the north and northeast of the Brisbane CBD and runs along the Brisbane River. An old commercial suburb that was once the home to many working wharves, Teneriffe is a now a trendy inner-city suburb that mostly consists of apartment developments. Fabric has been designed to incorporate the traditional elements of Teneriffe and has drawn inspiration from the old commercial warehouses and buildings surrounding it. 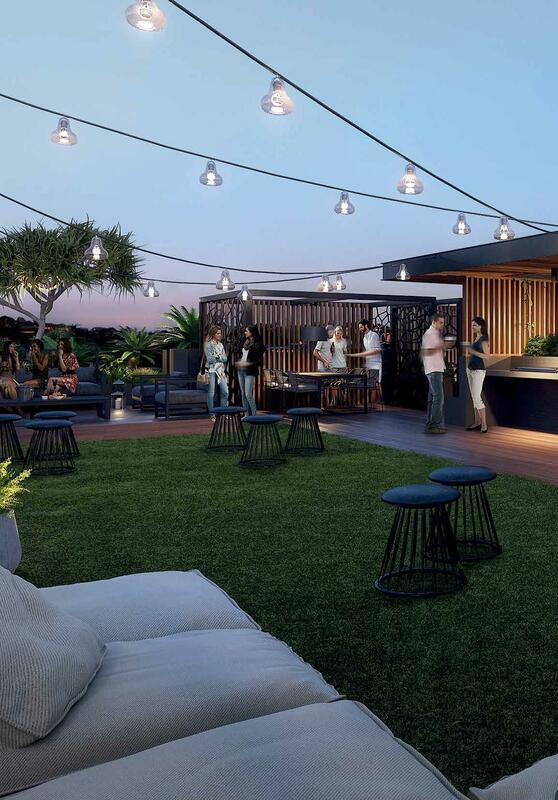 Living at Fabric, you will have easy access to a range of public transport options including multiple bus stops, the City Cat Ferry and Fortitude Valley Train Station. You will also be within walking distance to a myriad of local shops, coffee shops and restaurants. Construction is underway with the basement works well advanced. Estimated completion is mid-2019. 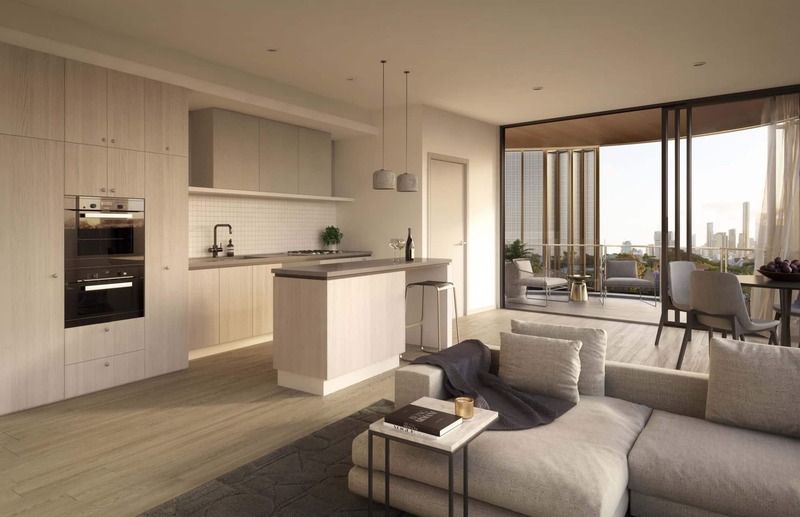 Brisbane SkytowerBrand-new apartments with amazing views and a central Brisbane CBD location. Fabric is a distinctive and quite beautiful building to look at – or at least the artist’s impression of the building is at this stage. It is very sleek and quite narrow, occupying a corner triangular lot. Is it perhaps channelling the famous Flatiron building in New York? One way or the other we like it and it is certainly a step up on many of the uninspiring architecture that we find in modern apartment developments in Brisbane at the moment. 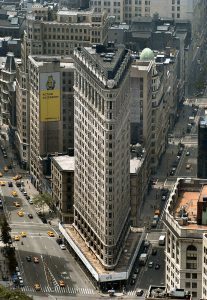 Fabric design is similar to the famous Flatiron building in New York. Fabric consists of 73 apartments in total over eight levels. There is a combination of one, two and three bedroom apartments in this development. There are 14 x one bedroom apartments, 7 x one bedroom + study apartments, 32 x two bedroom apartments, 10 x two bedroom + MPR apartments and 11 x 3 Bedroom, 2 Bathroom apartments. The 14 x one bedroom, one bathroom apartments are priced from $426,000 and range from 50m² – 59m² internally. These one bedroom apartments come with 1 parking spot in the secure underground carpark. 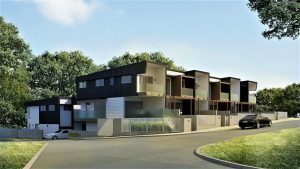 These are smaller apartments but not an uncommon size for new 1 bedroom apartments in the price range in Teneriffe and neighbouring Fortitude Valley. 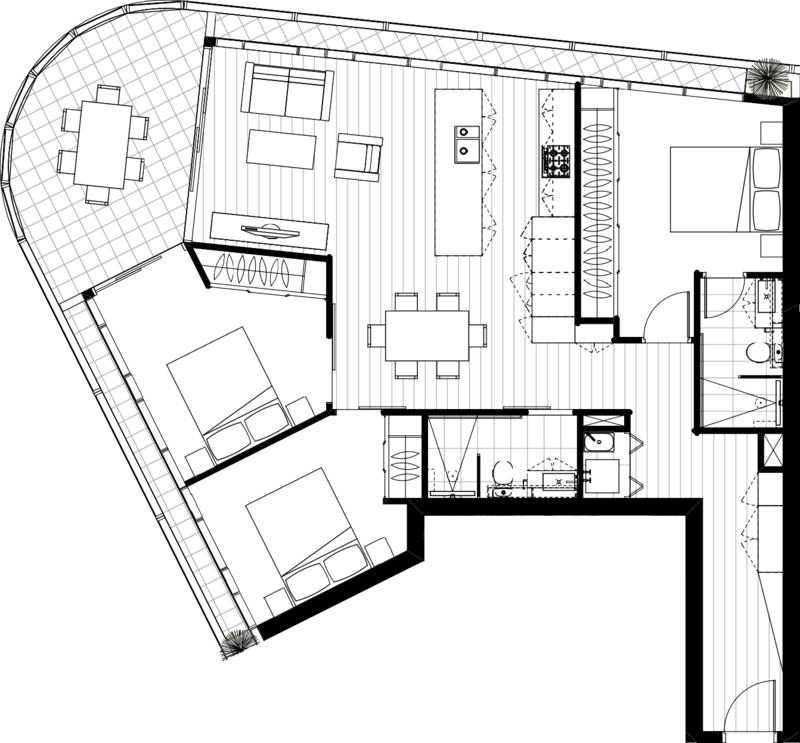 The 7 x one bedroom + study apartments are priced from $450,000 and are 64m² internally. These apartments also come with 1 car park. The study is more of a study nook than another room, but it is a large and functional desk non-the-less. The 32 x two bedroom, 2 bathroom apartments are priced from $685,000 and range from 71m² – 86 m². The master bedroom includes an ensuite. Some of the apartments come with island benches in the kitchen while some do not, obviously a space optimisation strategy. People who spend a lot of time in the kitchen and enjoy cooking may opt for the apartments which feature the island benches naturally. Accordingly, they will probably appeal more to owner occupiers and than investors. 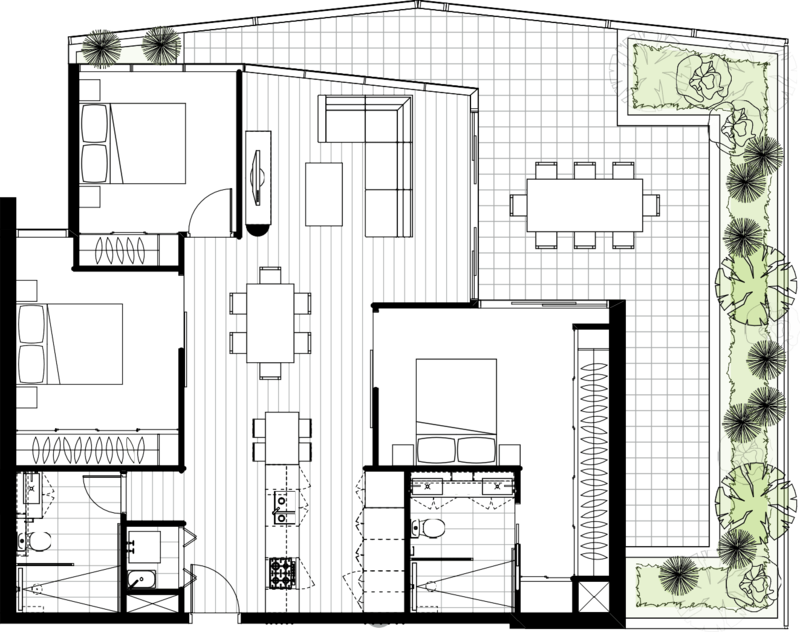 There are 10 x two bedroom + multipurpose room apartments. These are priced from $695,000. These apartments range from 87m² – 91m². Like many new apartments, the MPR is a large room but due to the fact it does not have a window for natural light, it can not really be referred to as a bedroom. At Fabric the MPR is definitely large enough for this purpose though, so could definitely operate as a study and a perfect fold out lounge when guests come to stay. The 11 x three bedrooms, 2 bathroom apartments range between $810,000 – $1,150,000. 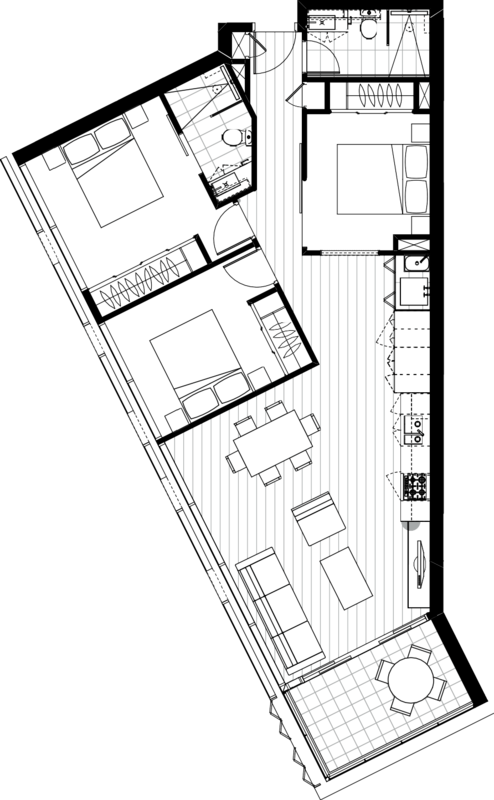 The 3 bedroom apartments have an internal size of 105 m² with large balconies. All apartments have a kitchen island bench and enough space for a separate/formal dining area. 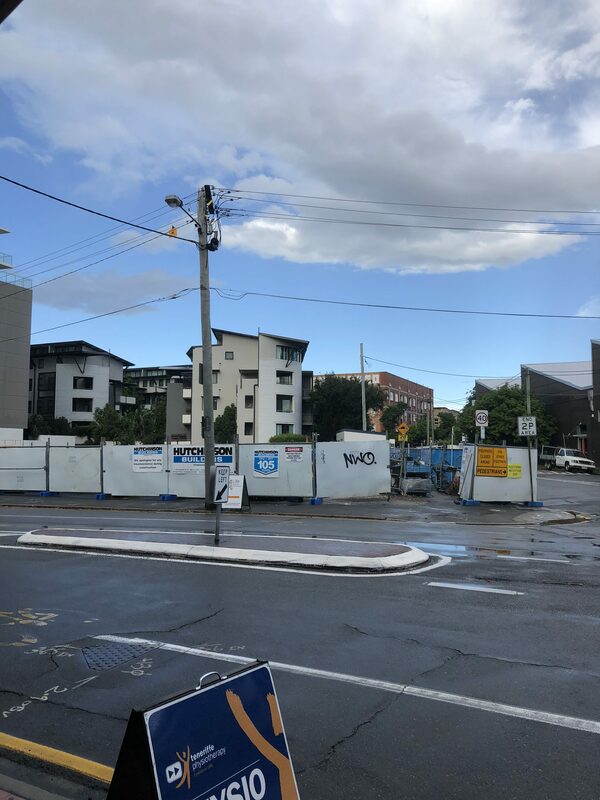 These apartments, being in the centre of Teneriffe, will not have “spectacular” views of the river or the city skyline. With the building only being 8 stories high only the top floors will get any views other than other buildings. All apartments come with power points on the balconies but no gas. One the ground floor of Fabric there will be retail spaces. These have not been leased yet. 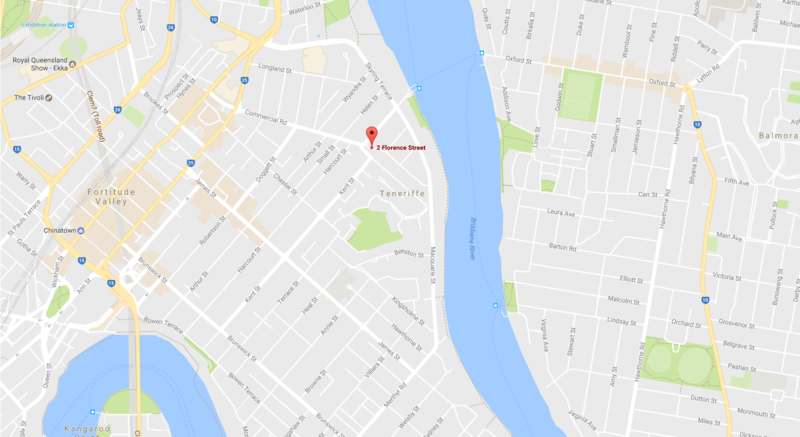 Fabric apartments are located at 2 Florence Street, Teneriffe. 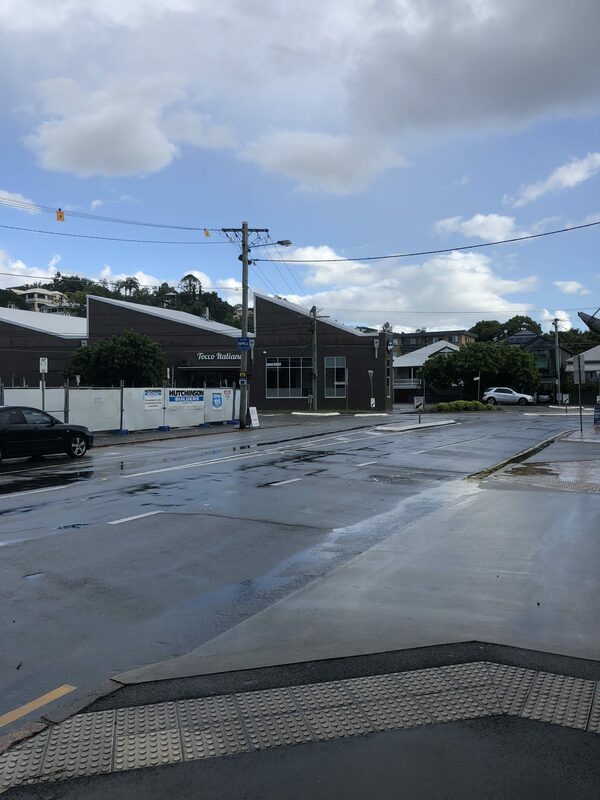 Teneriffe is an inner city suburb located 2.5km from Brisbane CBD. Teneriffe’s neighbouring suburbs include Newstead, Fortitude Valley and New Farm. Florence Street is located just off Commercial Road, which is the main road in Teneriffe. Commercial Road can be quite busy around peak hour traffic times. 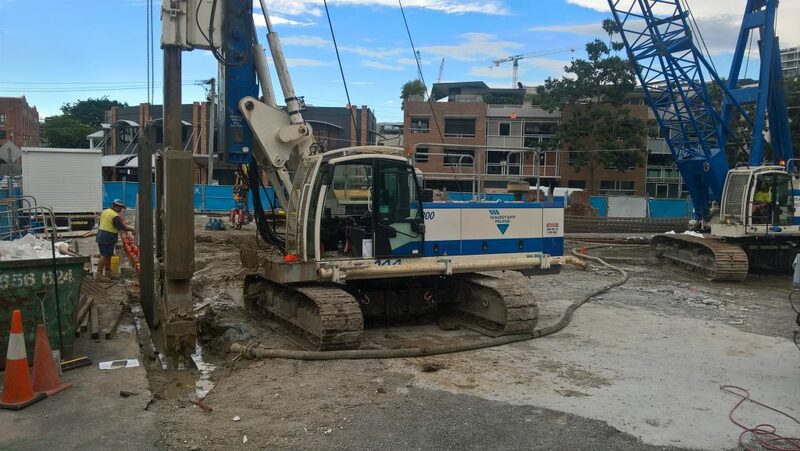 Teneriffe and Newstead consist of many offices so if you are thinking about these apartments keep this issue in mind. Commercial Road also links to Ann Street which is a main road the leads into the Brisbane CBD so regular traffic can be quite busy. Teneriffe is generally a busy place on the weekend with people coming into the suburb to go to local cafe’s, restaurants and retail shops. So even in off-peak times, the traffic and traffic noise can be quite a lot. Having said all of that, Teneriffe is a fantastic inner-city location in Brisbane and has an excellent restaurant, bar and cafe scene. So it’s busy but in a great way! Fabric Apartments is 1.1 km from James Street, meaning that residents can walk there in about 15 minutes. James Street is fast becoming one of Brisbane’s retail and lifestyle precincts and home to some of Australia’s most high-end fashion brands, homeware stores and cafes and restaurants. The closest bus stop to Fabric Apartments is 130 m away. This station has services running to the city about every 20 mins or so. A bus ride from this stop to Brisbane Central takes about 25 minutes. There is also a CityCat service from the Teneriffe ferry terminal. The ferry terminal is a 400 m walk from Fabric apartments. Ferry services from this terminal leave every 20 minutes and takes around 30 minutes to get to the Brisbane City Riverside terminal. There really isn’t a close train station in Teneriffe, the closest being Fortitude Valley station which is 1.7 km, about a 20-minute walk. Teneriffe doesn’t really have any schools central to the suburb. Some primary schools that are close are Holy Spirit Primary School- 1.7 km, New Farm State School- 1 km and All Hallows School (all grades)- 2.4 km. There really aren’t any secondary schools that are in close proximity to Teneriffe, the closest being Brisbane Grammar- 3.6 km. Teneriffe has a population of 4,700 residents, with the average income of $1,348 per week. The predominant age group in Teneriffe is under 35 and Independent Youths. The median sale price for a two bedroom apartment in Teneriffe is $600,000. The median rent price for a two bedroom apartment in Teneriffe is $540 per week. The price point for these apartments reflects on the quality of internal and communal features. All apartments come with fully ducted air conditioning which is the norm in Teneriffe and inner-city apartments now. 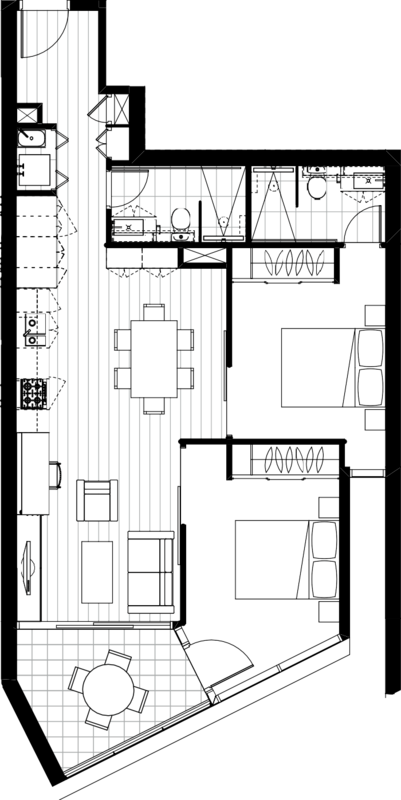 The kitchen layout differs throughout apartments. 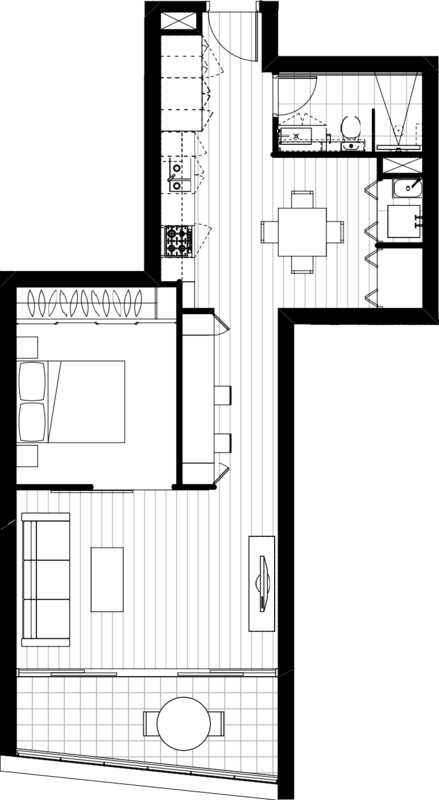 Some two bedrooms, two bathroom apartments have an island bench in the kitchen and some don’t. This is no doubt a space-saving option for some apartments. The three bedroom apartments have an island bench with an attached breakfast bar. All kitchens have European appliances with Gas cooktops. The splashback is tiled which is a benefit when it comes to cleaning. Timber flooring covers the kitchen, dining and living room, whilst the bedrooms are carpeted. The bathrooms feature floor to ceiling tiling. The bathrooms in all apartments (besides one of the three bedroom apartments) have single sink vanities, which for the price point for these apartments you might expect a little more. 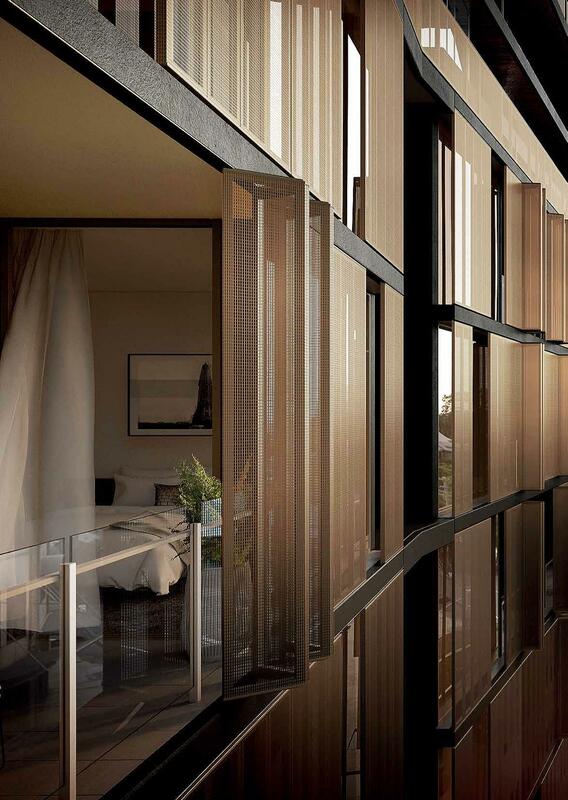 The entry point to the balconies is floor to ceiling glass which helps the balcony become part of the true living space. Another benefit of floor to ceiling glass doors and windows is that it will let in as much natural light as possible. There are no fans in this development, but as mentioned before, all apartments have ducted air-conditioning. In terms of body corporate rates, owners can expect to pay $2,500 – $4,900 each year at Fabric. This fee is quite a reasonable rate considering Fabric has a rooftop retreat with a pool and a BBQ area. 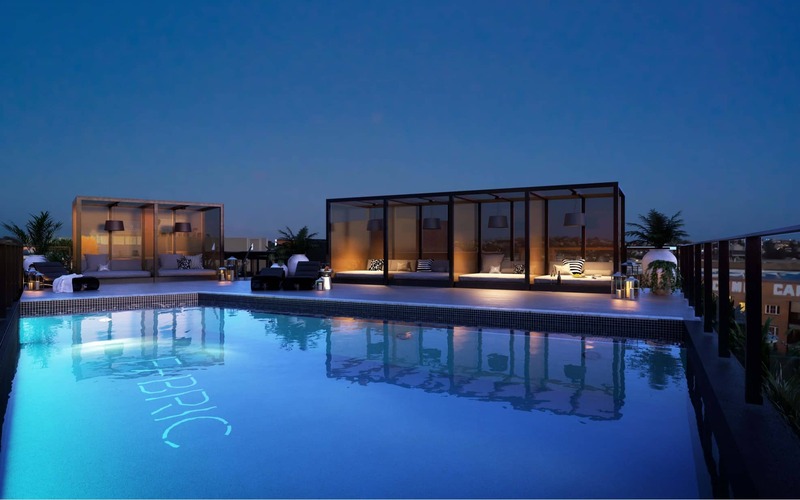 The expected rent at Fabric apartments ranges from $400 – $1,000 depending on the apartment type. It is unknown at this point if there is an Onsite Manager and if so who it is. This will be updated in the future. 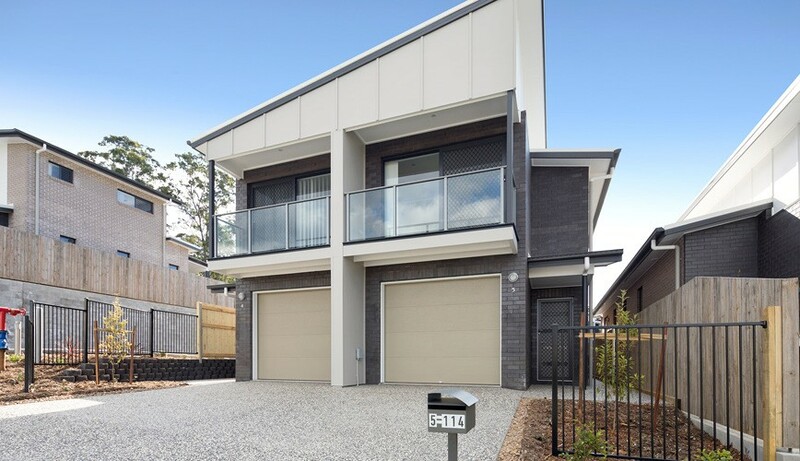 There aren’t that many brand new apartment complexes available in Teneriffe however, the neighbouring suburb of Newstead is booming with new developments. Developments like Gasworks, Skyring and Waterfront. Fabric would be competing with mainly owner-occupier apartments, where it would seem like the more affordable or convenient option. Fabric is being developed by Pointcorp. 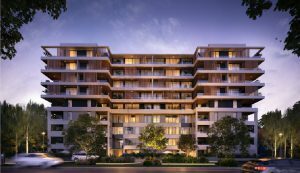 They are based in West End and have numerous luxury projects in Queensland including Bloom in Coomera, Point Luxe in St Lucia, The Maxwell and the Highgate. 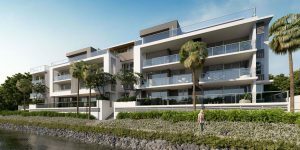 Pointcorp are known for delivering high-quality apartment buildings that are some of the standouts in South East Queensland.